Anglican women clergy are to rally in Westminster later at a march supporting plans to introduce women bishops. 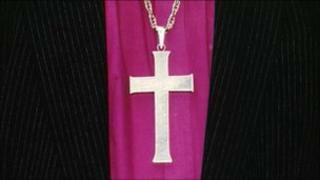 The Church of England's ruling body, the General Synod, is to discuss legislation on women bishops this week. It will consider a proposal that women bishops should accept intervention in their dioceses by male alternatives if called in by traditionalist parishes. Progressive Anglicans fiercely oppose the plans, claiming it would make women second-class bishops. They say it would force women to accept measures not imposed on their male counterparts. It is accepted that the legislation should allow conservative parishes access to a male alternative, but traditionalists are fighting for two further concessions, and, it is becoming apparent, one in particular. Firstly, they will back a move on Wednesday to give those male alternative bishops their own authority to intervene in parishes written into the law itself, rather than them acting only at the discretion and under the authority of the woman bishop. But it seems that they would be prepared to sacrifice even this "shared jurisdiction" if they could be sure of getting a particular kind of alternative male bishop. Traditionalist Anglo-Catholics on the synod will try to use Wednesday's session to get a guarantee incorporated into the law of access to what they regard as fully "authentic" bishops - in particular, men who were not ordained by a woman. Some traditionalists say they cannot be confident a man ordained by a woman has truly become a priest or bishop, and fear that he might not be able in reality to preside, for example, over Holy Communion. It is a controversial position - especially with the supporters of women bishops who hate the idea of perpetuating a separate class of bishops "untainted" by women clergy. But for many traditionalists it is only such a guarantee that would make having women bishops tolerable. The debate is the last opportunity for traditionalists to amend legislation bound to lead to profound change in the Church before the synod reaches a final vote in July.